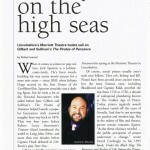 This article by Robert Loerzel originally appeared in Playbill magazine in April 2012. When it comes to pirates in pop culture, Jack Sparrow is a Johnny-come-lately. He’s been swashbuckling his way across movie screens for a mere nine years — since 2003, when Johnny Depp starred in the first Pirates of the Caribbean film. Sparrow certainly cuts a dashing figure, but he owes a lot to the fictional buccaneers who sailed before him. Gilbert and Sullivan’s The Pirates of Penzance helped launch a popular fascination with nautical naughty boys way back in 1879. That was four years before Robert Louis Stevenson’s Treasure Island introduced the world to Long John Silver, and more than two decades before Captain Hook debuted in J.M. Barrie’s play Peter Pan. Those Pirates of Penzance are an unusual bunch, as far as pirates go. Yo ho ho and a bottle of rum? Well, these fellows are more inclined to sip sherry. And they’re all orphans, too tenderhearted to attack other orphans. 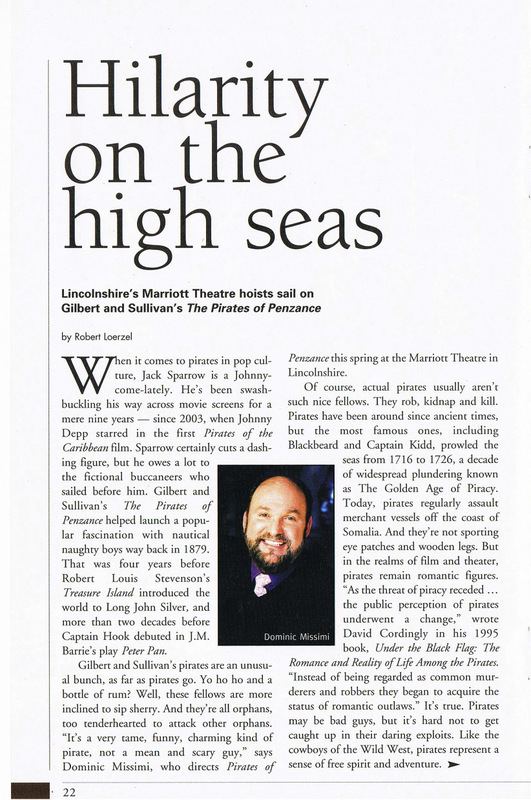 “It’s a very tame, funny, charming kind of pirate, not a mean and scary guy,” says Dominic Missimi, who directs Pirates of Penzance this spring at the Marriott Theatre in Lincolnshire. Of course, actual pirates usually aren’t such nice fellows. They rob, kidnap and kill. Pirates have been around since ancient times, but the most famous ones, including Blackbeard and Captain Kidd, prowled the seas from 1716 to 1726, a decade of widespread plundering known as The Golden Age of Piracy. Today, pirates regularly assault merchant vessels off the coast of Somalia. And they’re not sporting eye patches and wooden legs. But in the realms of film and theater, pirates are romantic figures. “As the threat of piracy receded … the public perception of pirates underwent a change,” wrote David Cordingly in his 1995 book Under the Black Flag: The Romance and Reality of Life Among the Pirates. “Instead of being regarded as common murderers and robbers they began to acquire the status of romantic outlaws.” It’s true. Pirates may be bad guys, but it’s hard not to get caught up in their daring exploits. Like the cowboys of the Wild West, pirates represent a sense of free spirit and adventure. Stevenson’s Treasure Island is the definitive literary portrait of pirates, but Gilbert and Sullivan’s musical has also had a lasting impact. “In spite of its lighthearted approach to the subject, The Pirates of Penzance has had a considerable influence on the way many people view pirates today,” observed Cordingly. Missimi, who recently retired as a theater professor at Northwestern University, was also thinking about toys when he decided how the music should sound. So he’s asked music director Ryan Nelson to pare down composer Arthur Sullivan’s traditional orchestrations to smaller arrangements, with a touch of calliope and carnival music. “I want it to have a much more zestful, toylike quality,” Missimi says. W.S. 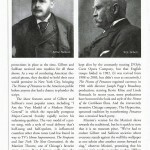 Gilbert’s libretto isn’t exactly kids’ stuff, but the plot follows a rather preposterous course. One of the main characters, Frederic, was supposed to be apprenticed to a ship’s pilot when he was a young lad. But his nurse heard wrong and took him to a pirate ship instead. Now that he’s 21 years old, he’s free to go. Or is he? Since he was born on Feb. 29 in a leap year, it turns out that he won’t reach the age of 21 until 1940. Director Missimi says one of the keys to performing Gilbert and Sullivan’s topsy-turvy zaniness is to treat it with seriousness and respect. “You do it pretty dead seriously, only to see just how absurd the characters or the situations are,” he says. 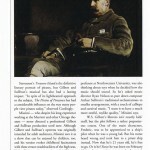 Spoofing operas and melodramas of the day, as well as the stuffy pretensions of English society, Gilbert specialized in jokes and “topsy-turvy” plot devices. 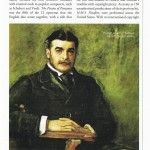 Meanwhile, Sullivan brilliantly blended his own inventive melodies with musical nods to popular composers like Schubert and Verdi. The Pirates of Penzance was the fifth of the 12 operettas that the English duo wrote together, with a title that contained a double meaning. Part of the joke was that Penzance, a peaceful English resort town, was an unlikely place to find pirates. 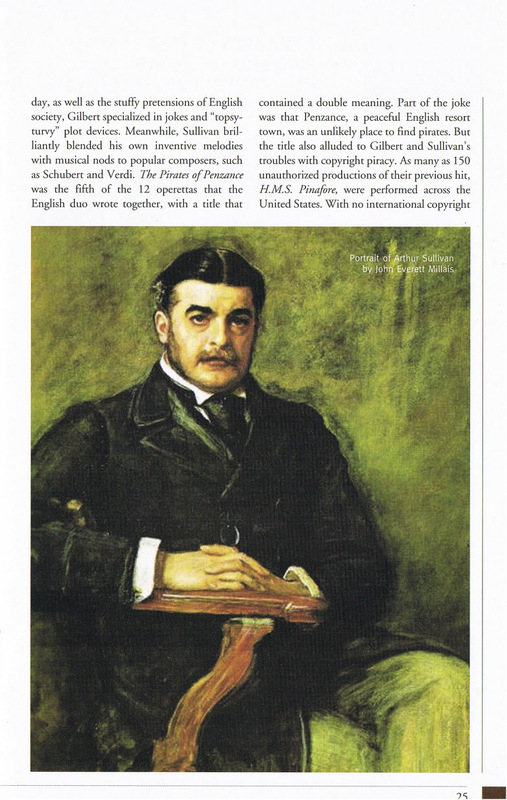 But the title also alluded to Gilbert and Sullivan’s troubles with copyright piracy. As many as 150 unauthorized productions of their previous hit, H.M.S. Pinafore, were performed across the United States. 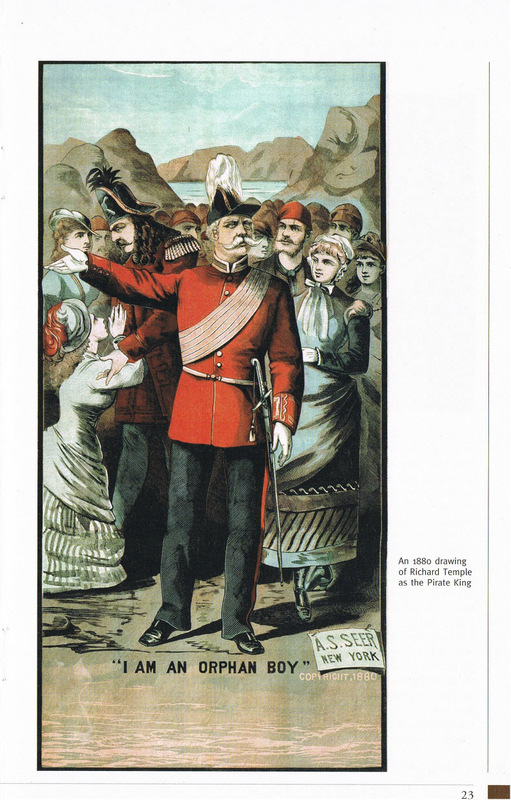 Without any international copyright law in place at the time, Gilbert and Sullivan received zero royalties for all those shows. As a way of combating American theatrical pirates, they decided to hold their next world premiere in New York City, bringing The Pirates of Penzance to the American public before anyone else had a chance to plunder the script. 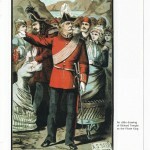 The show features some of Gilbert and Sullivan’s most popular tunes, including “I Am the Very Model of a Modern Major-General” in which the especially pompous Major-General Stanley rapidly recites his redeeming qualities. The very model of a patter song, with a style of vocal delivery that’s half-sung and half-spoken, it influenced countless other show tunes (and has found its way to TV’s Home Improvement, The Simpsons and Star Trek: The Next Generation). At the Marriott Theatre, one of Chicago’s favorite stage actors, Ross Lehman, will play the Major-General. And as if there aren’t already enough words wedged into that song, playwright Kingsley Day is squeezing in a few new lyrics, including some joking allusions to the Chicago theater scene. 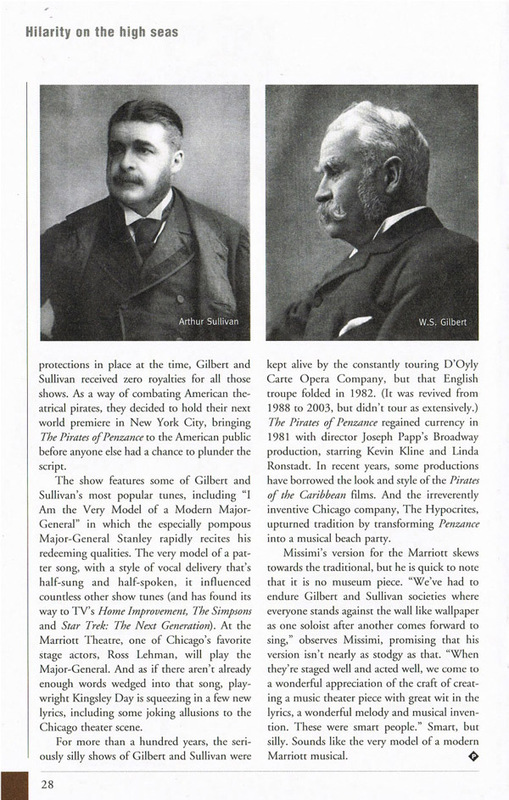 For more than a hundred years, the seriously silly shows of Gilbert and Sullivan were kept alive by the constantly touring D’Oyly Carte Opera Company, but that English troupe folded in 1982. (It was revived from 1988 to 2003, but didn’t tour as extensively.) The Pirates of Penzance regained currency in 1981 with director Joseph Papp’s Broadway production, starring Kevin Kline and Linda Ronstadt. Some recent productions have borrowed the look and style of the Pirates of the Caribbean films. And the irreverently inventive Chicago company The Hypocrites upturned tradition by transforming Penzance into a musical beach party. Missimi’s version for the Marriott skews toward the traditional, but he is quick to note that it is no museum piece. 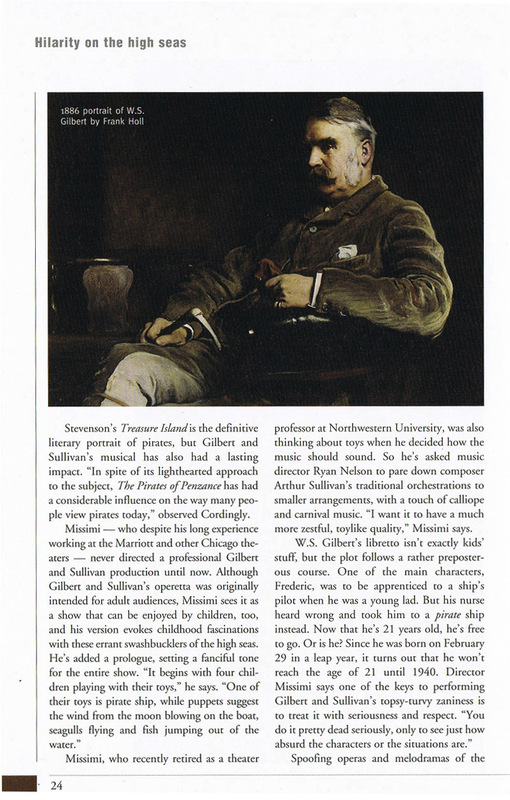 “We’ve had to endure Gilbert and Sullivan societies where everyone stands against the wall like wallpaper as one soloist after another comes forward to sing,” observes Missimi, promising that his version isn’t nearly as stodgy as that. “When they’re staged well and acted well, we come to a wonderful appreciation of the craft of creating a music theater piece with great wit in the lyrics, a wonderful melody and musical invention. These were smart people.” Smart, but silly. That sounds like the very model of a modern Marriott musical.